Denver Regional Transportation District’s (RTD) nearly 1,000 buses will roll with new vehicle tracking, communications and dispatching equipment featuring INIT’s Automated Stop Announcements (ASA) starting Sept. 23. The GPS-based system will provide audio and visual stop announcements inside the buses and broadcast route and destination information outside the buses when the doors open at bus stops. 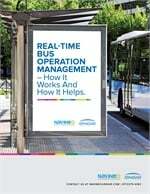 “By replacing aging equipment, we have gained technology that reduces driver distractions, assists in meeting Americans with Disabilities Act community needs and generally improves the customer experience for all riders through accurate and consistent information,” said Bruce Abel, RTD assistant GM of bus operations. RTD has been working for three years to reach this milestone with the help of ASA Advisory Panel members. The panel helped RTD with a number of issues–when to trigger announcements in advance of a stop, the length and content of audio and visual announcements, which stops will be announced and frequency of external announcements.